Thank you so much, Mommy Cici for sharing about it! Following her on Instagram, I get to know all the latest updates easily and faster... Which includes how to shop at Lazada and pay for it at 7 Eleven! It was my first time shopping at Lazada (okay, okay I know I'm so outdated...). What got me attracted was of course, how easy it is to pay. Ever since being locked out of my own Maybank2u account (lupa password), I kind of slowed down a bit on shopping for things online. Whether an online shopping website or those personal businesses requiring to pay online. It was really easy! Just go to the 7E counter and tell them you want to pay Lazada through MOLPay. Just show them a screenshot of the transaction id, there will be two barcodes in one page, they will scan both barcodes. And them simply pay the amount stated in cash. So easy! See? I mentioned easy TWICE in one paragraph so really, it is really easy! Easy peasy simple pimple. Anyhow, here's a more detailed explanation on paying for Lazada at 7E as written by Mommy Cici. Happy shopping! bash beli ni berapa? sya dulu beli ni jugak. pastu bile stop pumping teros sya simpan. sebab takat botol adam sya letak je kat drainer pinggan mangkok tu. hehehehehe. dlu sbb pump banyak compartments kan. tu yg kena ada benda ni. pastu sya let go kt preloved group tak silap sebab husband semak barang byk sangat. now nak beli balik. but sya aim another brand. nanti kalau jadi beli baru share kt blog. Sya, ini RM25 tapi tambah postage jadi RM30. 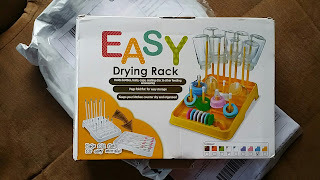 Rasa macam okay la harga dia kut lagipun sebab jarang jumpa benda alah ni. Sebelum ni pun letak dalam bekas macam tapisan... Konon-konon nak kasi macam fancy sikitla tempatnya.. hahahhaha. Yang ni okayla warna samala juga macam dalam gambar. Okayla for a first timer, kira good experience la ni. Heh.